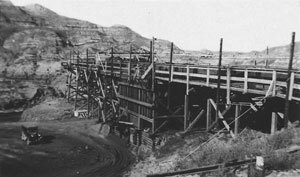 The communities of the Drumheller Valley were built upon the industrious mines. 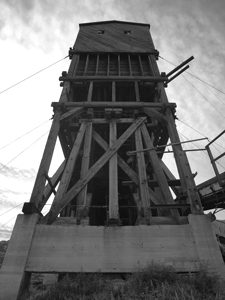 However, mysterious events are abound in the history of mining in the valley. One of the most tragic mine accidents occurred at the Monarch Mine #1573 on June 24, 1941. While digging the initial tunnel for the mine, several workers, John Waters, Chris Bezenus, and Robert Taylor, were caught in a methane explosion. A rescue party from he nearby Atlas Coal Mine #1484 fell victim to poisonous gases. Harry Crowder, Mine Manager, died as a result of breathing the toxic carbon monoxide fumes. Recorded in the accident notes is something that defies explanation and happened right before the rescue team from the Atlas Mine left to aid the miners at the Monarch Mine. A wife of one of the workers at the Monarch Mine was at home taking a nap in the afternoon and awoke to the sound of someone calling her name. She went to her neighbours and asked if anyone had been looking for her, but no one had. “She had this terrible feeling that there had been an explosion,” said Jay Russell, Program Director at the Atlas Coal Mine. The wife ran down to Atlas Mine and swore to the Crowder that there had been an accident. “Around that time the explosion was definitely heard,” said Russell. “I don’t know if she had heard an explosion and this was a secondary explosion, but at that point it was obvious that something had happened. “What defies explanation is the wife, waking up from a nap, and having a premonition of an explosion,” added Russell. Adding to the mysterious nature of the mines were several random discoveries of deceased miners. “Any accident would have an inquiry to find out what happened,” explained Russell. The official cause of death for the men was heart attack, although two of the men were in their early twenties, which is perhaps too early to suffer a cardiac arrest. Not much else is known because the deaths occurred when the miners were working alone. Not all of the bizarre events ended in tragedy. Lives were spared many times from the occasional cave in. Animal intuition has a history of trumping the senses of humans and the lives of some coal miners were owed to the ponies they used to haul loads of coal. One of the more famous ponies at the Atlas Coal Mine was named Strawberry. “She was often given to the new drivers because she knew more about the job than the new guys did,” explained Russell. A new, young driver was given Strawberry for the day and given the task of taking a cart underground. They came to a doorway in the mine and Strawberry stopped dead in her tracks. Coaxing, bribery using carrots, and pushing would not move Strawberry. “He finally had enough, he thought that the guys were pulling a prank on him giving him a difficult pony,” said Russell. Dejected, the driver unhooked Strawberry, brought her to the other side of the cart, hooked her up, and began the ascent out. No sooner than they had left, the area where Strawberry had stopped collapsed. The mines could be dangerous and plenty of mysteries permeate their records. Most will unfortunately remain unsolved. The coal mines that dotted the area are mostly gone, but the Atlas Coal Mine continues to preserve the artifacts that have made the Drumheller Valley into what it is today. However, not everything left at the Atlas Coal mine is corporeal. The coal mine has been a hub for paranormal activity for years. The most famous of these spiritual encounters occurred in 1948. A welder braved the dark confines of the Atlas Mine alone on a Saturday. Soon he began to hear a distant percussive rumbling noise. Timbers creaked, water dripped, but this noise was foreign to him. The welder dismissed the noise and continued to work, but the rumbling persisted, and continued to grow louder. The welder could no longer ignore the racket, and decided to investigate. Shining his light down the mine he only saw a torrent of mice coming towards him. Mice were common in the mines and were a reassuring sight to miners because they often were the harbingers of dangerous gases. However, the flood of mice running towards the lone welder were a troubling sight and the rumbling was getting closer and louder. Finally the welder saw the light at the end of the tunnel. “Just as he was getting close to the edge he felt a hot breath on his neck, and when he dived out he heard a blood curdling scream like a dinosaur,” said Russell. Expecting to be eaten, the welder was relieved when the mice washed over him and nothing happened. Bending over he tied his shoe and when he looked over, in the coal dust, there was a three-toed footprint. Shaken, he ran from the mine, across the bridge, and home where he would not speak of the terror for years. Disturbing occurrences have continued throughout the years, and the staff of the coal mine have their own spiritual encounters. “One year ago, I was in the wash house and I got a fire going to warm things up,” said Russell. He went out to get wood from the area that was once the private shower for the bosses. In this room there is also a brass bed frame. The origin and use of the bed is shrouded in rumor, but it has been told that the bed was used by the night watchman at the coal mine, as he had no other place to stay. In exchange for sleeping in the wash house, the kindly guard would warm up the building and cook breakfast on the stove for the miners. Maybe it was the apparition of the night watchman, or one of the others who used that bed over the years, but when Russell went to fetch wood to warm up the wash house, the bed banged against the wall three times. Other worldly activity is not just limited to the lone staff member either. Strange things are afoot at the Atlas Coal Mine, so much so that the mine has had paranormal investigators visit. Visitors are welcome to do their own paranormal research during the Haunted Coal Mine, running from October 22 to 30. 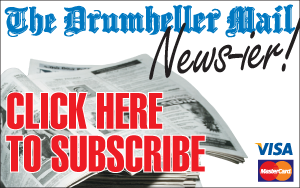 Some might say that Drumheller came into existence in 1916 when it was officially named a town. Others might say it began with the mines, or with the farmers and ranchers who settled in the valley. Look to the walls of the valley and there is a deeper history written in the rocks themselves and far more is told in the rocks that lie below the ground. If we rewind the clock back to 4.6 billion years ago, things were quite different. It was an Earth that resembled something more like Dante’s Inferno. Volcanoes spewed out lava that would cool and form the granite terrain of Alberta, which in turn would be eroded and deposited into the nearby coast, which would have been roughly where the Rocky Mountains are today. The Earth may have mostly been a hellish landscape, but it was also a time of huge extremes. Roughly 750 to 580 million years ago the Earth may have undergone four ice ages. The entire surface of the planet, Drumheller included, was entirely covered by kilometre-thick ice in a condition known as Snowball Earth. When the climate warmed up again the nearby ocean slowly crept inland. By 490 million years ago Drumheller was under a shallow sea. The sea retreated briefly at the beginning of the Devonian Period (418 million years ago), eroding the rocks laid down earlier. After 10 million years the sea returned. Reefs grew in the warm, shallow waters. Drumheller and many other areas in Alberta rely on these ancient reefs today. The Devonian reefs and the organisms that lived in them would eventually become the fuel that drives industry in Alberta: petroleum. The sea gradually fell back, and after 100 million years Drumheller was once again dry land. Drumheller was on the coast of the continent Laurasia (composed of North America, Europe, and Asia), and eventually the super continent Pangaea. The plants and animals that inhabited Drumheller would have looked alien in comparison to today. Giant ferns, horsetails, and other now-extinct trees would have dominated the area. Large insects, such as dragonflies, amphibians, and reptiles would have prowled the vegetation. With every continent glued together, the climate became much drier. Drumheller would have suffered under long dry seasons, punctuated by monsoons and the occasional storm coming off the ocean. Pangaea began to break apart by the end of the Triassic (205 million years ago) and finished during the Jurassic. The climate became wetter, allowing Drumheller to be covered in extensive swamps and forests. Dinosaurs would have been quite conspicuous at this time, such as huge long-necked dinosaurs. Other animals, such as small mammals, would have scurried about as well. The Jurassic saw the rise of the Rocky Mountains as well. British Columbia collided with the west coast of Canada and rocks that had previously been under the ocean, or buried deep within the ground were thrust upward. Up to this point all of the rocks that tell this story are buried beneath the surface. This is where the Cretaceous aged rocks that line the Drumheller Valley come in. The burgeoning Rocky Mountains caused the lands to the east to sink, allowing the formation of a sea that stretched from the Arctic Ocean to the Gulf of Mexico. For most of the Cretaceous, Drumheller was sandwiched between the mountains to the west and the sea to the east. Large rivers ran through the area, and Drumheller would have been part of a large coastal plain and would have resembled Florida. The layers of rock lining the valley were laid down by the massive rivers that meandered throughout the land. The rivers carried tonnes of sediment that was shedding off the Rocky Mountains, making an ideal environment to entomb the dinosaurs and other animals that perished. Extensive wetlands were present at this time. When buried by sediment from rivers, the decaying vegetation would form the layers of coal that fueled the growth of the towns that would later inhabit the area. The climate remained warm and humid. Hurricanes and storms would have occasionally battered the area, flooding the land and killing many animals, which accounts for many of the fossils found in the area. Forests and swamps contained conifers, ferns, and the relatively new flowering plants. Vast herds of horned and duckbilled dinosaurs wander the land, hunted by ferocious predators such as Albertasaurus. The sea that covered parts of North America at one point grew to cover Drumheller. The rocks that were deposited at this time form the base of the hoodoos near East Coulee. The waters were filled with ammonites and large marine reptiles, such as mosasaurs and plesiosaurs. The sea drained from North America by the end of the Cretaceous and things came crashing to an end. A combination of volcanoes and a large asteroid impact finished the dinosaurs and many other animals alive at the time. Things were briefly quite dire, but soon the warm temperatures and heavy rainfall that characterized Drumheller in the Age of Dinosaurs returned. Forests of conifers and broad leaved trees dominated the area, with rivers, lakes, marshes, and plains dotting the land. Without the dinosaurs around, mammals began to flourish, although many did not initially resemble what we see today. The climate gradually became cooler and drier. The Rocky Mountains prevented moisture from the Pacific Ocean reaching the lands to the east. The result was that the forests covering Drumheller gave way to grass covered plains. Two million years ago the planet started experiencing repeated ice ages. Drumheller was repeatedly covered in glaciers that were nearly a kilometre in height and that extended down into the United States. The glaciers scoured the land and formed many of the topographical features we see today. 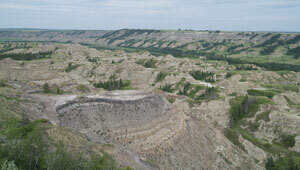 The hilly terrain north of Drumheller, towards Stettler is the result of water flowing underneath the glacier. The large boulders that can be found on the prairies were carried by the glaciers from the mountains and dropped off on the prairies. The last glaciers retreated 10,000 years ago. As they were melting, the glaciers would form large lakes in front of them, dammed by ice and rubble. When the lakes would burst their dams the resulting torrents would carve out huge valleys. The Red Deer River valley is thought to have formed when the lake covering Red Deer was released. Over the millennia since the valley formed, the elements have slowly eroded the edges of the valley and exposed the natural treasures that lie beneath the prairies, encouraging the growth of the mines and palaeontology. The valley itself is relatively young, but the area has undergone tremendous transformations over the life of the planet. Drumheller has been a fiery inferno, a serene sea, to tropical oceanfront property, and winter may be coming, but at least we’re not under a glacier anymore.